We discuss event-based programming, Sametime services, and the Sametime Place architecture. architecture, and a sample to customize the chat window supplied by the toolkit. Next we describe the Sametime C++ Toolkit, and build a full-blown Sametime Connect client in C++. We also discuss considerations for developing Win32 programs in C++. Finally, we describe the newest additions to the Sametime client toolkits: the Sametime COM Toolkit and the Sametime Links Toolkit. Sametime portlets for WebSphere Portal Server are included in an appendix. Most of the samples in this book are available in source format from the IBM Redbooks Web site. 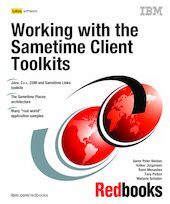 This book is based on the Sametime 3.0 client toolkit.